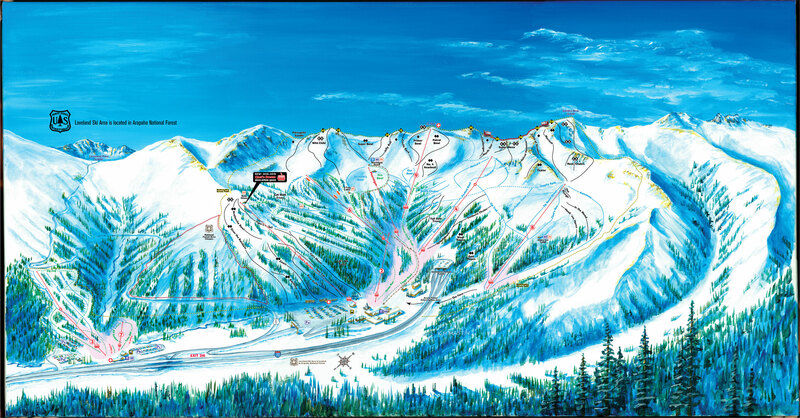 High atop the Continental Divide, Loveland Ski Area features 9 lifts serving 1,800 acres of exceptional terrain. Loveland has two separate base areas and both host rental shops, sport shops, restaurants and bars. 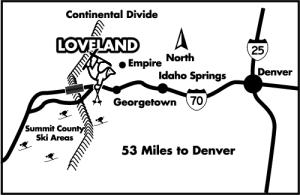 Loveland Valley is a separate area just for beginners. This unique area is the perfect place for newcomers to work on their technique away from intermediate and expert snow-riders. With their own lifts and gentle terrain, it’s here that newcomers can develop their new found love of skiing or snowboarding. Loveland Basin is the main area and offers a wide variety of terrain. Wide-open cruisers, trees, bumps, and open bowls: whatever you like to ski or ride, you are sure to find it at Loveland Basin. And high adventure doesn’t come any higher than The Ridge. Served by Lift 9 which takes skiers and riders up to 12,700′, The Ridge provides intermediate and advanced snow-riders terrain just the way they like it – open, steep and deep. With 480 acres to choose from right off the lift, 100 hikeable acres and free snowcat rides to some of Loveland’s most exhilarating terrain, The Ridge offers an experience like no other!